Kristina Martinez is from Holland, Michigan and has been improvising since 2008. She started taking classes at Atlas Improv Co. in Madison, Wisconsin, soon joining the ranks in 2008. 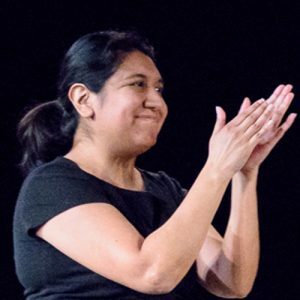 She had a number of roles while at Atlas Improv including performing, teaching, coaching and leading corporate trainings. She moved to DC in 2017 and plays in her indie duo team Goodison. You can also find her with the ensemble Love Onion. While not on stage, Kristina uses resources to find answers to people’s questions at a library. She’s happy to converse about movies, what it’s like to have older siblings, or how you don’t have to strictly be a dog-person or a cat-person, cause she really loves both cats and dogs. She loves cats AND dogs.